Railroad enthusiasts examine old railroad maps during the Bradford Railroad Museum’s annual festival Saturday. Children ride the barrel train at the Bradford Railroad Museum’s annual festival Saturday. Gavin Stonerock, 3, of Bradford, sits with his mother Ashley in a Woodings railroad motorcar during the Bradford Railroad Museum’s annual festival Saturday. 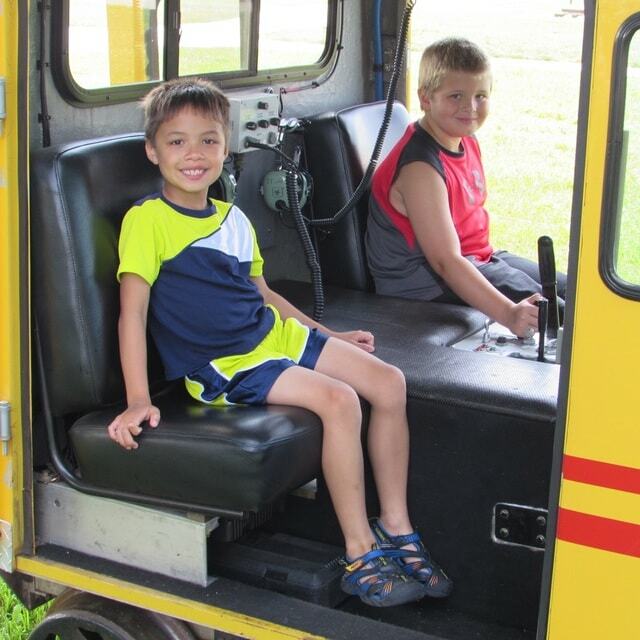 Cousins Ashton Noggle, 7, of Greenville (left), and Logan Nation, 9, of Pleasant Hill (right), were among those who attended Saturday’s festival at the Bradford Railroad Museum. BRADFORD — On Saturday, the Bradford Railroad Museum held its 2015 Railroad Festival, celebrating 130 years of railroad history at the junction. Museum Director Marilyn Kosier was joined by 17 volunteers who helped with set up and activities. The festival offered activities for young, old and all ages in between. Children’s activities included more than 17 different games with prizes awarded for ticketed games. Youngsters also got the opportunity to take a ride in a barrel train. For the older set, the museum offered train movies and a plethora of railroad artifacts. Stuart and Cathie Edmondson of Columbus displayed a railroad motorcar, often called a “speeder,” at the event. The Edmondsons are members of the North American Railcar Operators Association (NARCOA.org), a group of railcar enthusiasts who restore, operate and display railroad motorcars at events around the country. The speeder displayed at Bradford’s Y-Yard Park was built in 1982 by the Woodings Railcar Company and was once used by the Canadian Pacific Railroad. “It was one of the last ones built before being replaced by the hy-rail vehicles,” said Edmondson. The museum conducted a 50-50 drawing, a raffle for “N-scale” model railroad box cars, and a silent auction. The Bradford Railroad Museum is located at 200 North Miami Avenue in Bradford. For information on days, hours of operation and entrance fees, visit the organization’s website at www.bradfordrrmuseum.org.